The fishing is as expected this time of year, very good! It’s usual October experiences for everyone fishing in Estero Bay right now. Redfish are everywhere, Snook are still close to the passes and inlets but expect them to start moving once we get a few more cold fronts moving in. 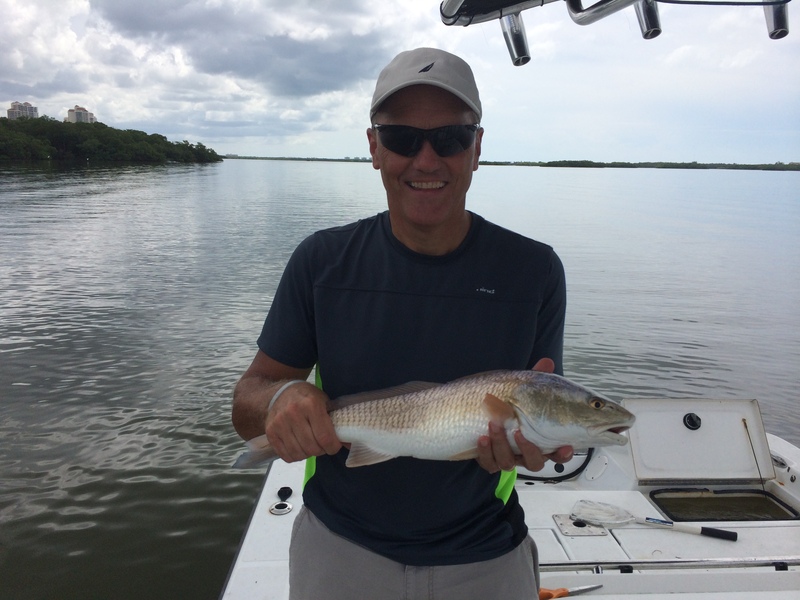 Right now the flats are great action for the fisherman with shallow drafting boats, schools of Redfish can be found as long as you can get to them without them knowing you’re there, or your boat bottoming out on the shallow flats. Pinfish are good but when fishing the flats sometimes a 5 inch Gulp jerk shad rigged on a weedless worm hook is the go to method. You can cover lots of ground and Redfish this time of year are not picky. A little girl fishing the other day caught one on a piece of a hot dog if that tells you anything! Get out early and find the pins and even some pilchards on our grass flats, when deciding what flat to chum look for static grass flats. In other words all grass no sand spots. That will ensure your best chances of finding the bait you want. Tail hook the pins and nose hook the pilchards on a 2/0 Owner circle hook. Don’t bother going with any other hook when trying to decide, Owners are super sharp and the best quality i have found hands down. Once the tide starts creeping up start moving towards the bushes and use the same tactics to get the bite. A great tip i can offer is when using lures and not live bait fishing a shoreline, position the boat so you can make casts that are parallel to the trees you are fishing while being close as possible to the trees. This will drastically change how many fish you catch since your bait stays in the strike zone much longer than casting directly at them and pulling it out. This is the prefect time to fish our area so get out and fish!